The 2015 "Irish Open Hosted by The Rory Foundation" will be held from May 28-31 and McIlroy believes he can help attract a title sponsor and some big name players with 2007 Walker Cup players Rickie Fowler and Billy Horschel possibly set for a return to the Newcastle course. "We are really excited about it," McIlroy said at Gleneagles. "I am going to host the Irish Open next year and hopefully for the years to come, obviously. "It is hosted by me and my charitable foundation, so there is going to be a big charity element to it. "We are kust trying to restore the Irish Open to what it once was. It has struggled the last few years trying to get a title sponsor and trying to get a good field on good golf courses. "I thought there is no better place to get involved than Royal County Down. I am pretty close with a lot of guys on tour and I am sure I will persuade a few of them to come over and play which is going to be a huge deal. "I am working along with some companies trying to get a title sponsor on board — just trying to make it a bigger and better tournament. "So I am excited to be involved and it sort of shows my commitment to Irish golf and the European Tour." Dustin Johnson, currently on leave of absence, was also on that winning US Walker Cup team alongside US Open winner Webb Simpson and Chris Kirk, runner up to Horschel in the FedEx Cup. Keen to attract big names from Europe and the US, McIlry said: "A lot of the US Tour guys played in that Walker Cup in '07 and I've already talked to a few of them about coming over and obviously a few others. "I am close to a lot of guys on tour and we will see what happens and how it fits into guy's schedules but hopefully we can get a few guys over and make it a great tournament." McIlroy’s last competitive outing saw him battling for a $11.4 million payday in the Tour Championship, but the world number one is equally fired up by the thought of playing for team glory at the Ryder Cup. “It’s a group of people that you know well and they all have one goal, one collective task which is to win the Ryder Cup and beat the US team,” McIlroy told BBC Radio Five Live. “The money doesn’t matter to us any more, it doesn’t matter if we’re playing for millions of pounds all over the world. This means as much to us or even more than any other thing that we play for. It’s a big deal to us, we want to play as well as we can and try to win. “I arrived here yesterday evening and hit some balls last night, I just wanted to get here a bit early and make sure I am prepared for Friday. It’s been a long stretch (of golf) for me. Just as he did in 2012, McIlroy enters the week ranked number one in the world and the reigning US PGA champion – he also won the Open at Royal Liverpool - making him a “target” for the opposition. But the four-time major winner is not concerned, adding: “I like it. It gives me a little bit more of a boost to go out there and try and play well. 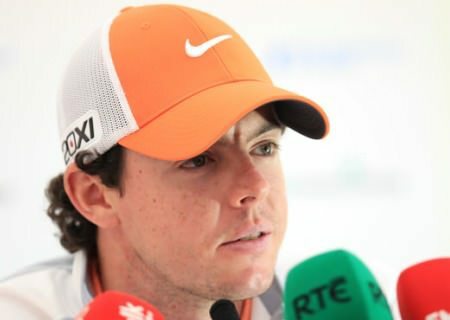 His mere presence is a gilt-edged guarantee but the news that the Rory McIlroy Foundation is to host the Irish Open at Royal County Down next May coverts the golden boy into the King Midas of Irish golf. McGinley: "I’ve been on a learning curve all my life for this role"